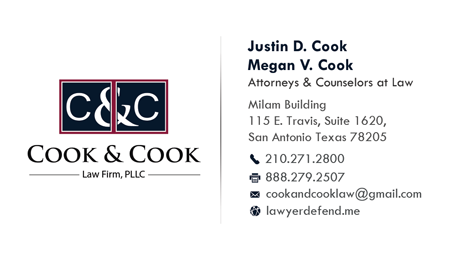 The challenging aspect of uncontested divorce is not acquiring forms, but rather properly and enforceably, dividing your life from your spouse. Form companies just provide you with filled in templates. They do not provide the necessary analysis or offer to correctly draft the documents that you need for your particular situation. 1. Uncontested: Where you and your spouse AGREE on how to divide everything in your divorce. 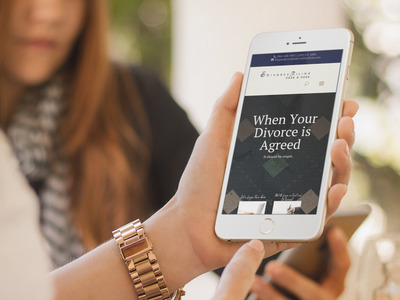 “Uncontested divorce”, “simple divorce”, “agreed divorce”, and even “cheap divorce”– these terms are used interchangeably all over the internet. And, in fact you can have quite a large estate and still have an uncontested divorce. The defining factor is that both spouses will readily agree to how to divide things and once the agreements are in writing, the spouses will readily agree to sign the papers. 2. Contested: Where you and your spouse disagree about how to divide something in your divorce. This will mean that both spouses should hire a lawyer on a retainer, and will likely need to attend court for at least one contested hearing. Most people believe their case is contested, and then eventually, they reach the same agreement they could have come to, without paying the lawyers thousands of dollars first. What Do We Do at Cook & Cook For Our Clients? Your spouse does not have a lawyer of record. (Your spouse can have a reviewing lawyer, but not a lawyer that opposes the case). Up to 7 Hours of Client Support, at no added charge* Yes ? **If case is extremely simple estate, a reviewing attorney will not be used, and only a drafting attorney will handle case. 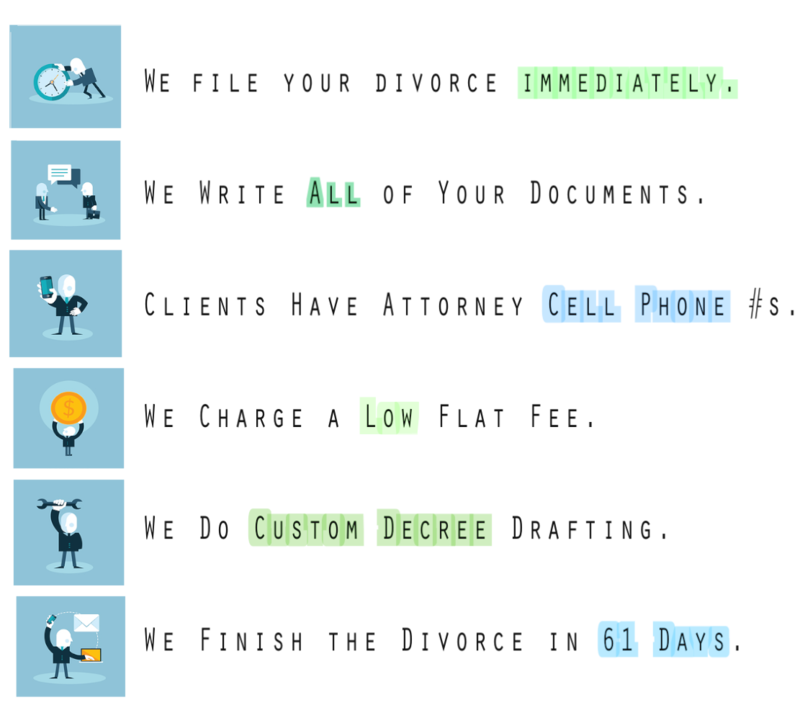 **This 7 hours can include phone time to explain divorce law, or back and forth to revise your decree as you need, or just plainly explaining the divorce process to you. 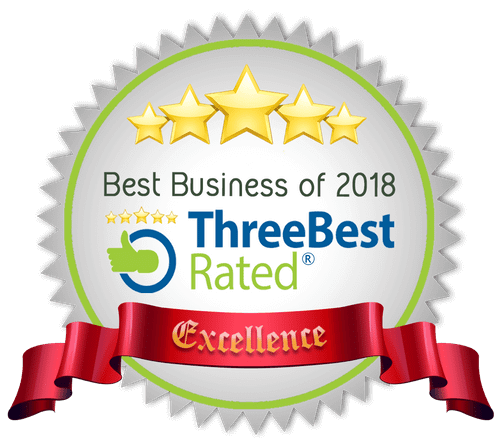 You would be surprised how much support you might want, as you go through your divorce, and we are here to help.  Having Cook & Cook for you uncontested divorce lawyer will save you tons of time, and ensure you are protected in the future from your spouse trying to get future earnings, or make you pay debts that you did not agree to. Call today (512) 253-4330. Email today: megan@lawyerdefend.me. If you would like to file your divorce with us, you can right now, right here. Call today (512) 253-4330. 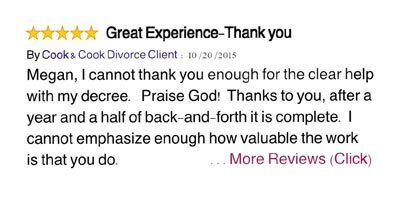 We know that figuring out about the right divorce package/service can be confusing. Let us help you.